Some of the largest companies are teaming together to fight hunger in America, at a time of the year when it’s needed most. Walmart last week announced its Fighting Hunger Together Campaign to make sure foodbanks have enough supplies to last during the spring and summer months. The foodbanks come to the aid of the 49 million Americans who suffer from food insecurity and struggle to get food on the table. General Mills, ConAgra Foods, Kraft Foods and Kellogg Company are joining the hunger relief effort which was announced last week in Nashville, Tennessee. 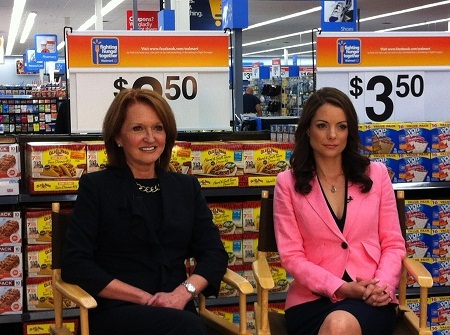 Walmart says customers can help the hungry when they shop. A press release said signs in the Walmart locations will point customers to products which will have “on-package labels that will “advise customers how to generate meals by entering product codes online, sharing a hashtag on Twitter or scanning a QR code.” Walmart says the campaign is expected to produce 42 million meals. You can also take part in the campaign by visiting the Walmart facebook page and voting for a community to win a million dollars. The most important impact of the campaign though will be the awareness it raises about hunger in America. For at this time of the year donations to foodbanks are often reduced and this is especially a cause for alarm with unemployment rates high and potential budget cuts to food assistance programs in Congress. Anna Hogan of the Cincinnati Freestore Foodbank says, “right now is typically the time period when donations are a bit less likely…. most donations come in during the holidays, and there is typically a drop off during the Spring and Summer. The Freestore is holding a Hunger Walk next month to help build up food supplies. Aside from immediate supply shortages, the biggest problem facing the fight against hunger is awareness. There is enough food in the country but funding cuts or not enough involvement from government, the public or companies leaves those fighting hunger without enough resources to do the job. There is strength in numbers. The more people become aware and get involved the more likely hunger can be ended in America. Article first published as Teaming up to Defeat Hunger in America on Blogcritics.